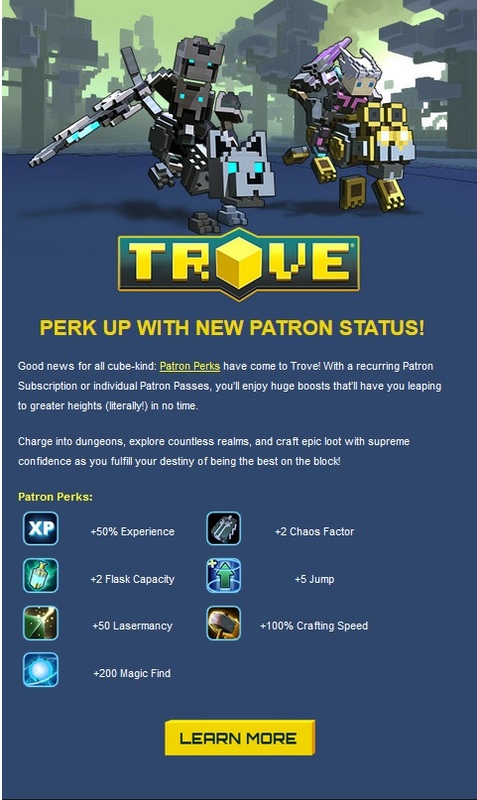 But anyway, I haven’t played Trove since that day I posted here. I’m still on those happy early stages of the game, so I don’t know how those perks would affect gameplay. But yeah, I hate cash shops that offer power. It creates this privileged x peasant division to the player base that really bugs me. I only played ArcheAge when it launched, and only as a free player. But just from testing it for a few days I got the feeling that whoever had more cash would have more fun on that game, so I quit. But $150 for being in alpha? That is shocking! I understand why you would want to avoid games by the same company. I was on alpha for Allods Online and when that game launched and their cash shop went full money-grab-mode it was so heart breaking. It was a great game with great art design and fun mechanics, but the cash shop just killed it for most of the people who tested it. But I don’t know about Trove. I’ll continue playing it as long as I’m having fun. And honestly, I’m only spending cash if I think its worth it. Because of my Allods experience, I only spend money on a game if I feel happy playing it as a free player. So I’ll test it and see where it goes. Out of curiosity, what is your opinion on Rift? It’s another game that I just played very little but got a good impression. And the sense that I have (from blogs and forums) is that the cash shop is not the bad kind, but I’ve never really seen it. I’ve only played it before the F2P conversion. I’m only asking because it’s another game by Trion but it seems to have a good reputation online. Have you played it? ps. Whenever you want to play SWG I’m up for it, but probably really late at night, like after 22h (for me :p). I just logged in just to pay my rent, haha.